You’ve created a Facebook Group – now what do you do to get people to join your group? Send out a Facebook group invite of course! If you run a Facebook Group, there are three ways you can send out a Facebook Group invite. Which type of Facebook Group invite do we use? Depending on the type of group you run, you’ll want to consider which type of invitation is right for your group. For example, if your Facebook Group is made up of people you’re friends with on Facebook, you’ll want to use the first option. The downside to using this type of Facebook Group invite is that it’s very impersonal because it doesn’t give you the option to enter a message to that person. Instead, they receive a standard email letting them know that someone has invited them to join a Facebook Group. If you want a more customizable option, you’ll want to use the second option – sending a private message. This way you can add in your own message so that your invitation is a little more personal for members who you invite. If your Facebook Group is made up of people you don’t have a personal connection with on Facebook, the third option is your best bet. This allows you to enter in someone’s email address; however, it doesn’t give you the opportunity to customize the message to people you invite to join the group. How to invite members to join a Facebook Group? 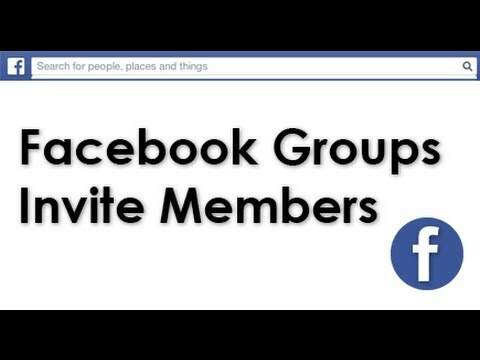 Now that you’ve selected the type of Facebook Group invite you want to use, follow the instructions in the video below to send a Facebook Group invite. Who should we send a Facebook Group invite to? When sending out group invites, be sure you only invite people who will contribute to and add value to your Facebook Group. This is important because if you just add people to your group to get the number up, but there is little meaningful conversation happening, your group won’t go anywhere and eventually, people might leave because there’s nothing happening within the Facebook Group. To make your Facebook Group a success, make sure you are selective about who you send a Facebook Group invite to. Sure, your group may grow at a slower rate, but remember, you are bringing in the right people to be a part of your group – the people who will contribute to conversations, post insightful information, and help propel your Facebook Group to new levels.